I asked myself if I could derive the main results of the Special Theory, the Rule for the Addition of Velocities, Space Contraction, Time Dilation and the ‘Equivalence’ of Mass and Energy from UET postulates. Instead of Einstein’s Postulate 2, the ‘absolute value of the speed of light’, I employ a more general but very similar principle, namely that there is a ‘limiting speed’ for the propagation of causal influences from one spot on the Locality to another. In the simplest case, that of an event-chain consisting of a single ultimate event that repeats at every ksana, this amounts to asking ourselves ‘how far’ the causal influence can travel ‘laterally’ from one ksana to the next. I see the Locality as a sort of grid extending indefinitely in all directions where each ‘grid-position’ or ‘lattice-point’ can receive one, and only one, ultimate event (this is one of the original Axioms, the Axiom of Exclusion). At each ksana the entire previous spatial set-up is deftly replaced by a new, more or less identical one. So, supposing we can locate the ‘same’ spot, i.e. the ‘spot’ which replaces the one where the ultimate event had occurrence at the last ksana, is there a limit to how far to the left (or right) of this spot the ultimate event can re-occur? Yes, there is. Why? Well, I simply cannot conceive of there being no limit to how far spatially an ‘effect’ ─ in this case the ‘effect’ is a repetition of the original event ─ can be from its cause. This would be a holographic nightmare where anything that happens here affects, or at least could affect, what happens somewhere billions of light years away. One or two physicists, notably Heisenberg, have suggested something of the sort but, for my part, I cannot seriously contemplate such a state of affairs. Moreover, experience seems to confirm that there is indeed a ‘speed limit’ for all causal processes, the limit we refer to by the name of c.
However, this ‘upper speed limit’ has a somewhat different and sharper meaning in Ultimate Event Theory than it does in matter-based physics because c (actually c*) is an integer and corresponds to a specific number of adjacent ‘grid-positions’ on the Locality existing at or during a single ksana. It is a distance rather than a speed and even this is not quite right : it is a ‘distance’ estimated not in terms of ‘lengths’ but only in terms of the number of the quantity of intermediary ultimate events that could conceivably be crammed into this interval. In UET a distinction is made between an attainable limiting number of grid-positions to right (or left) denoted c* and the lowest unattainable limit, c, though this finicky distinction in many cases can be neglected. But the basic schema is this. A ‘causal influence’, to be effective, must not only be able to at least traverse the distance between one ksana and the next ‘vertically’ (otherwise nothing would happen) but must also stretch out ‘laterally’ i.e. ‘traverse’ or rather ‘leap over’ a particular number of grid-positions. There is an upper limit to the number of positions that can be ‘traversed’, namely c*, an integer. This number, which is very great but not infinite ─ actual infinity is completely banished from UET ─ defines the universe we (think we) live in since it puts a limit to the operation of causality (as Einstein clearly recognized), and without causality there can, as far as I am concerned, be nothing worth calling a universe. Quite conceivably, the value of this constant c i(or c*) is very different in other universes, supposing they exist, but we are concerned only with this ‘universe’ (massive causally connected more or less identically repeating event-cluster). So far, so good. This sounds a rather odd way of putting things, but we are still pretty close to Special Relativity as it is commonly taught. What of Einstein’s other principle? Well, firstly, I don’t much care for the mention of “laws of physics”, a concept which Einstein along with practically every other modern scientist inherited from Newton and which harks back to a theistic world-view whereby God, the supreme law-giver, formulated a collection of ‘laws’ that everything must from the moment of Creation obey ─ everything material at any rate. My concern is with what actually happens whether or not what happens is ‘lawful’ or not. Nonetheless, there do seem to be certain very general principles that apply across the board and which may, somewhat misleadingly, be classed as laws. So I shall leave this question aside for the moment. The occupied region between two or more successive causally related positions on the Locality is invariant. This requires a little elucidation. To start with, what do I understand by ‘occupied region’? At least to a first approximation, I view the Locality (the ‘place’ where ultimate events can and do have occurrence) as a sort of three-dimensional lattice extending in all directions which flashes on and off rhythmically. It would seem that extremely few ‘grid-spots’ ever get occupied at all, and even less spots ever become the seats of repeating events, i.e. the location of the first event of an event-chain. The ‘Event Locality’ of UET, like the Space/Time of matter-based physics, is a very sparsely populated place. Now, suppose that an elementary event-chain has formed but is marooned in an empty region of the Locality. In such a case, it makes no sense to speak of ‘lateral displacement’ : each event follows its predecessor and re-appears at the ‘same’ ─ i.e. ‘equivalent’ ─ spot. Since there are no landmark events and every grid-space looks like every other, we can call such an event-chain ‘stationary’. This is the default case, the ‘inertial’ case to use the usual term. We concentrate for the moment on just two events, one the clone of the other re-appearing at the ‘same spot’ a ksana later. These two events in effect define an ‘Event Capsule’ extending from the centre (called ‘kernel’ in UET) of the previous grid-space to the centre of the current one and span a temporal interval of one ksana. Strictly speaking, this ‘Event Capsule’ has two parts, one half belonging to the previous ksana and the other to the second ksana, but, at this stage, there is no more than a thin demarcation line separating the two extremities of the successive ksanas. Nonetheless, it would be quite wrong (from the point of view of UET) to think of this ‘Event Capsule’ and the whole underlying ‘spatial/temporal’ set-up as being ‘continuous’. There is no such thing as a ‘Space/Time Continuum’ as Minkowski understood the term. ‘Time’ is not a dimension like ‘depth’ which can seamlessly be added on to ‘length’ or ‘width’ : there is a fundamental opposition between the spatial and temporal aspect of things that no physical theory or mathematical artifice can completely abolish. In the UET model, the demarcations between the ‘spatial’ parts of adjacent Event Capsules do not widen, they remain simple boundaries, but the demarcations between successive ksanas widen enormously, i.e. there are gaps in the ‘fabric’ of time. To be sure there must be ‘something’ underneath which persists and stops everything collapsing, but this underlying ‘substratum’ has no physical properties whatsoever, no ‘identity’, which is why it is often referred to, not inaccurately, both in Buddhism and sometimes even in modern physics, as ‘nothing’. To return to the ‘Constant Region Postulate’. The elementary ‘occupied region’ may be conceived as a ‘Capsule’ having the dimensions s0 × s0 × s0 = s03 for the spatial extent and t0 ­for time, i.e. a region of extent s03 × t0 ­. These dimensions are fixed once and for all and, in the simplest UET model, s0 is a maximum and t0 ­is a minimum. Restricting ourselves for simplicity to a single spatial dimension and a single temporal dimension, we thus have an ‘Event Rectangle’ of s0 by t0­ . For anything of interest to happen, we need more than one event-chain and, in particular, we need at least three ultimate events, one of which is to serve as a sort of landmark for the remaining pair. It is only by referring to this hypothetical or actual third event, occurring as it does at a particular spot independently of the event-pair, that we can meaningfully talk of the ‘movement’ to left or right of the second ultimate event in the pair with relation to the first. Alternatively, one could imagine an ultimate event giving rise to two events, one occurring ‘at the same spot’ and the other so many grid-spaces to the right (or left). In either case, we have an enormously expanded ‘Event Capsule’ spatially speaking compared to the original one. The Principle of the Constancy of the Area of the Occupied Region asserts that this ‘expanded’ Event Capsule which we can imagine as a ‘Space/Time rectangle’ (rather than Space/Time parallelipod), always has the ‘same’ area. How can this be possible? Quite simply by making the spatial and temporal ‘dimensions’ inversely proportional to each other. As I have detailed in previous posts, we have in effect a ‘Space/Time Rectangle’ of sides sv and tv (subscript v for variable) such that sv × tv = s0 × t0 = Ω = constant. Just conceivably, one could make s0 a minimum and t0 a maximum but this would result in a very strange universe indeed. 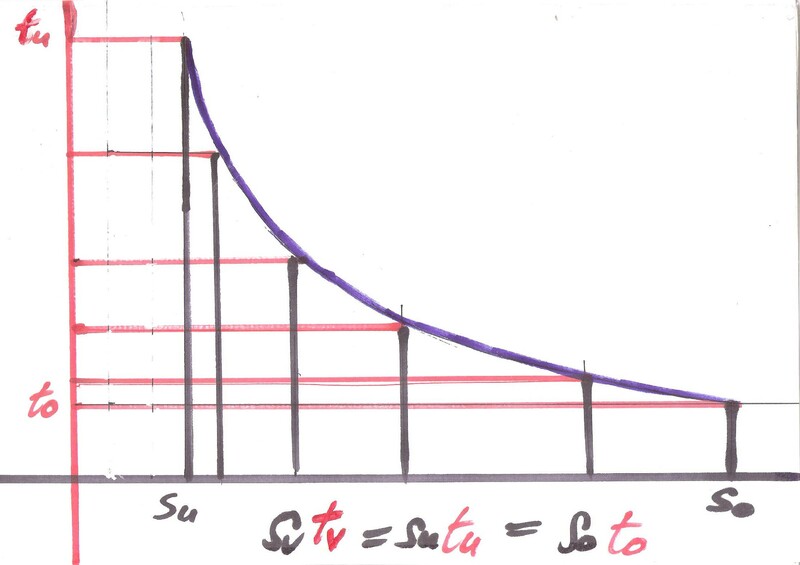 In this model of UET, I take s0 as a maximum and t0 as a minimum. These dimensions are those of the archetypal ‘stationary’ or ‘inertial’ Event Capsule, one far removed from the possible influence of any other event-chains. I do not see how the ‘mixed ratio’ s0 : t0 can be determined on the basis of any fundamental physical or logical considerations, so this ratio just ‘happens to be’ what it is in the universe we (think we) live in. This ratio, along with the determination of c which is a number (positive integer), are the most important constants in UET and different values would give rise to very different universes. In UET s0/t0 is often envisaged in geometrical terms : tan β = s0/t0 = constant. s0 and t0 also have minimum and maximum values respectively, noted as su and tu respectively, the subscript u standing for ‘ultimate’. We thus have a hyperbola but one constrained within limits so that there is no risk of ‘infinite’ values. What is ‘speed’? Speed is not one of the basic SI units. The three SI mechanical units are the metre, the standard of length, the kilogram, the standard of mass, and the second, the standard of time. (The remaining four units are the ampere, kelvin, candela and mole). Speed is a secondary entity, being the ratio of space to time, metre to second. For a long time, since Galileo in fact, physicists have recognized the ‘relational’ nature of speed, or rather velocity (which is a ‘vector’ quantity, speed + direction). To talk meaningfully about a body’s speed you need to refer it to some other body, preferably a body that is, or appears to be, fixed (Note 1). This makes speed a rather insubstantial sort of entity, a will-o’-the-wisp, at any rate compared to ‘weight’, ‘impact’, ‘position’, ‘pain’ and so forth. The difficulty is compounded by the fact that we almost always consider ourselves to be ‘at rest’ : it is the countryside we see and experience whizzing by us when seated in a train. It requires a tremendous effort of imagination to see things from ‘the other object’s point of view’. Even a sudden jolt, an acceleration, is registered as a temporary annoyance that is soon replaced by the same self-centred ‘state of rest’. Highly complex and contrived set-ups like roller-coasters and other fairground machines are required to give us the sensation of ‘acceleration’ or ‘irregular movement’, a sensation we find thrilling precisely because it is so inhabitual. Basically, we think of ourselves as more or less permanently at rest, even when we know we are moving around. In UET everything actually is at rest for the space of a single ksana, it does not just appear to be and everything that happens occurs ‘at’ or ‘within’ a ksana (the elementary temporal interval). I propose to take things further ─ not in terms of personal experience but physical theory. As stated, there is in UET no such thing as ‘continuous motion’, only succession ─ a succession of stills. An event takes place here, then a ksana or more later, another event, its replica perhaps, takes place there. What matters is what occurs and the number and order of the events that occur, everything else is secondary. This means not only that ultimate events do not move around ─ they simply have occurrence where they do have occurrence ─ but also that the distances between the events are in a sense ‘neither here nor there’, to use the remarkably apt everyday expression. In UET v signifies a certain number of grid-spaces to right or left of a fixed point, a shift that gets repeated every ksana (or in more complex cases with respect to more than one ksana). In the case of a truncated event-chain consisting of just two successive events, v is the same as d, the ‘lateral displacement’ of event 2 with respect to the position of event 1 on the Locality (more correctly, the ‘equivalent’ of such a position a ksana later). Now, although the actual number of ‘grid-positions’ to right or left of an identifiable spot on the Locality is fixed, and continues to be the same if we are dealing with a ‘regular’ event-chain, the distance between the centres (‘kernels’) of adjacent spots is not fixed but can take any number (sic) of permissible values ranging from 0 to c* according to the circumstances. The ‘distance’ from one spot to another can thus be reckoned in a variety of legitimate ways ─ though the choice is not ‘infinite’. The force of the Constancy of the Occupied Region Principle is that, no matter how these intra-event distances are measured or experienced, the overall ‘area’ remains the same and is equal to that of the ‘default’ case, that of a ‘stationary’ Event Capsule (or in the more extended case a succession of such capsules). This is a very different conception from that which usually prevails within Special Relativity as it is understood and taught today. Discussing the question of the ‘true’ speed of a particular object whose speed is different according to what co-ordinate system you use, the popular writer on mathematics, Martin Gardner, famously wrote, “There no truth of the matter”. Although I understand what he meant, this is not how I would put it. Rather, all permissible ‘speeds’, i.e. all integral values of v, are “the truth of the matter”. And this does not lead us into a hopeless morass of uncertainty where “everything is relative” because, in contrast to ‘normal’ Special Relativity, there is in UET always a fixed framework of ultimate events whose number within a certain region of the Locality and whose individual ‘size’ never changes. How we evaluate the distances between them, or more precisely between the spots where they can and do occur, is an entirely secondary matter (though often one of great interest to us humans). In most books on Relativity, one has hardly begun before being launched into what is pretty straightforward stuff for someone at undergraduate level but what is, for the layman, a completely indigestible mass of algebra. This is a pity because the actual physical principle at work, though it took the genius of Einstein to detect its presence, is actually extreme simple and can much more conveniently be presented geometrically rather than, as usual today, algebraically. As far as I am concerned, space contraction and time dilation are facts of existence that have been shown to be true in any number of experiments : we do not notice them because the effects are very small at our perceptual level. Although it is probably impossible to completely avoid talking about ‘points of view’ and ‘relative states of motion’ and so forth, I shall try to reduce such talk to a minimum. It makes a lot more sense to forget about hypothetical ‘observers’ (who most of the time do not and could not possibly exist) and instead envisage length contraction and time dilation as actual mechanisms which ‘kick in’ automatically much as the centrifugal governor on Watt’s steam-engine kicks in to regulate the supply of heat and the consequent rate of expansion of the piston. See things like this and keep at the back of your mind a skeletal framework of ultimate events and you won’t have too much trouble with the concepts of space contraction and time dilation. After all why should the distances between events have to stay the same? It is like only being allowed to take photographs from a standing position. These distances don’t need to stay the same provided the overall area or extent of the ‘occupied region’ remains constant since it is this, and the causally connected events within it, that really matters. Take v to represent a certain number of grid-spaces in one direction which repeats; for our simple truncated event-chain of just two events it is d , the ‘distance’ between two spots. d is itself conceived as a multiple of the ‘intra-event distance’, that between the ‘kernels’ of any two adjacent ‘grid-positions’ in a particular direction. For any specific case, i.e. a given value of d or v, this ‘inter-possible-event’ distance does not change, and the specific extent of the kernel, where every ultimate event has occurrence if it does have occurrence, never changes ever. There is, as it were, a certain amount of ‘pulpy’, ‘squishy’ material (cf. cytoplasm in a cell) which surrounds the ‘kernel’ and which is, as it were, compressible. This for the ‘spatial’ part of the ‘Event Capsule’. The ‘temporal’ part, however, has no pulp but is ‘stretchy’, or rather the interval between ksanas is. If the Constant Region Postulate is to work, we have somehow to arrange things that, for a given value of v or d, the spatial and temporal distances sort themselves out so that the overall area nonetheless remains the same. How to do this? 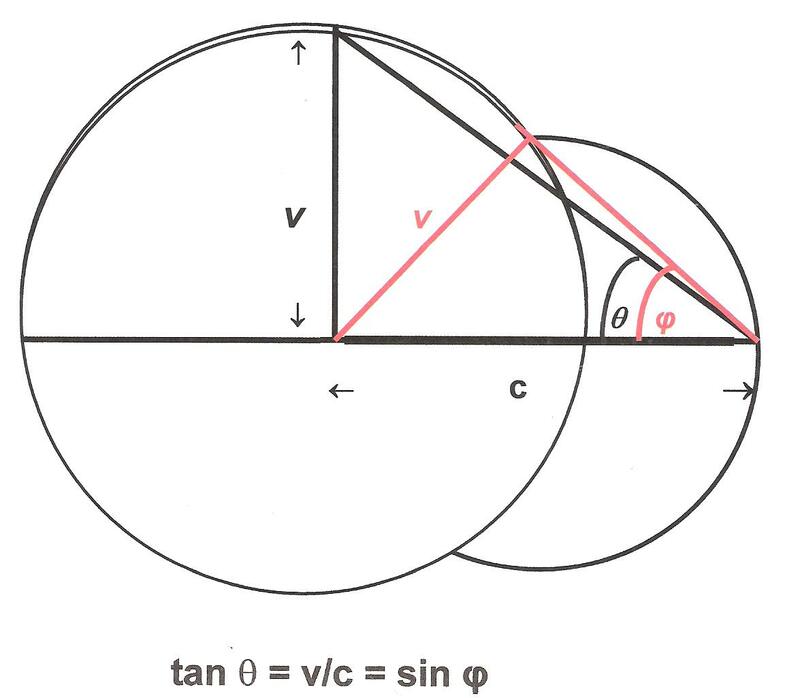 The following geometrical diagram illustrates one way of doing this by using the simple formula tan θ = v/c = sin φ . Here v is an integral number of grid-positions ─ the more complex case where v is a rational number will be considered in due course ─ and c is the lowest unattainable limit of grid-positions (in effect (c* + 1) ). Do these contractions and dilations ‘actually exist’ or are they just mathematical toys? As far as I am concerned, the ‘universe’ or whatever else you want to call what is out there, does exist and such simultaneous contractions and expansions likewise. Put it like this. The dimensions of loci (spots where ultimate events could in principle have occurrence) in a completely empty region of the Locality do not expand and contract because there is no ‘reason’ for them to do so : the default dimensions suffice. Even when we have two spots occupied by independent, i.e. completely disconnected, ultimate events nothing happens : the ‘distances’ remain the ordinary stationary ones. HOWEVER, as soon as there are causal links between events at different spots, or even the possibility of such links, the network tightens up, as it were, and one can imagine causal tendrils stretching out in different directions like the tentacles of an octopus. These filaments or tendrils can and do cause contractions and expansions of the lattice ─ though there are definite elastic limits. More precisely, the greater the value of v, the more grid-spaces the causal influence ‘misses out’ and the more tilted the original rectangle becomes in order to preserve the same overall area. We are for the moment only considering a single ‘Event Capsule’ but, in the case of a ‘regular event-chain’ with constant v ─ the equivalent of ‘constant straight-line motion’ in matter-based physics ─ we have a causally connected sequence of more or less identical ‘Event Capsules’ each tilted from the default position as much as, but no more than, the last (since v is constant for this event-chain). This simple schema will take us quite a long way. If we compare the ‘tilted’ spatial dimension to the horizontal one, calling the latter d and the former d′ we find from the diagram that d′ cos φ = d and likewise that t′ = t/cos φ . Don’t bother about the numerical values : they can be worked out by calculator later. Viewed as an angle, or rather the reciprocal of the cosine of an angle, the ubiquitous γ of Special Relativity is considerably less frightening. It would appear that there is going to be a problem as d, or in the case of a repeating ‘rate’, v, approaches the limit c. Indeed, it was for this reason that I originally made a distinction between an attainable distance (attainable in one ksana), c*, and an unattainable one, c. Unfortunately, this does not eliminate all the difficulties but discussion of this important point will be left to another post. For the moment we confine ourselves to ‘distances’ that range from 0 to c* and to integral values of d (or v). Now, it must be clearly understood that all sorts of ‘relations’ ─ perhaps correlations is an apter term ─ ‘exist’ between arbitrarily distant spots on the Locality (distant either spatially or temporally or both) but we are only concerned with spots that are either occupied by causally connected ultimate events, or could conceivably be so occupied. For event-chains with a 1/1 ‘reappearance rhythm’ i.e. one event per ksana, the relation tan θ = v/c = sin φ (v < c) applies (see diagram) and this means that grid-spots beyond the point labelled c (and indeed c itself) lie ‘outside’ the causal ‘Event Capsule’ Anything that I am about to deduce, or propose, about such an ‘Event Capsule’ in consequence does not apply to such points and the region containing them. Causality operates only within the confines of single ‘Event Capsules’ of fixed maximum size, and, by extension, connected chains of similar ‘Event Capsules’. Within the bounds of the ‘Event Capsule’ the Principle of Constant Area applies. Any way of distinguishing or separating the spots where ultimate events can occur is acceptable, provided the setting is appropriate to the requirements of the situation. Distances are in this respect no more significant than, say, colours, because they do not affect what really matters : the number of ultimate events (or number of possible emplacements of ultimate events) between two chosen spots on the Locality, and the order of such events. We can legitimately apply any integral value of v < c and we will get a setting which keeps the overall area constant. However, this is done at a cost : the distance between the centres of the spatial element of the event capsules shrink while the temporal distances expand. The default distance s0 has been shrunk to s0 cos φ, a somewhat smaller intra-event distance, and the default temporal interval t0 has been stretched to t0 /cos φ , a somewhat greater distance. Remark, however, that sticking to integral values of d or v means that cos φ does not, as in ‘normal’ physics, run through an ‘infinite’ gamut of values ─ and even when we consider the more complex case, taking reappearance rhythms into account, v is never, strictly never, irrational. What is the greatest possible lateral distance? Is there one? Yes, by Postulate 2 there is and this maximal number of grid-points is labelled c*. This is a large but finite number and is, in the case of integral values of v, equal to c – 1. In other words, a grid-space c spaces to the left or right is just out of causal range and everything beyond likewise (Note 2). Now, suppose we have an ultimate event that simultaneously produces a clone at the very next ksana in an equivalent spot AND another clone at the furthest possible grid-point c*. Even, taking things to a ridiculous extreme to make a point, suppose that a clone event is produced at every possible emplacement in between as well. Now, by the Principle of the Constancy of the Occupied Region, the entire occupied line of events in the second ksana can either have the ‘normal’ spacing between events which is that of the ‘rest’ distance between kernels, s0, or, alternatively, we may view the entire line as being squeezed into the dimensions of a single ‘rest’ capsule, a dimension s0 in each of three spatial directions (only one of which concerns us). In the latter case, the ‘intra-event’ spacing will have shrunk to zero ─ though the precise region occupied by an ultimate event remains the same. Since intra-event distancing is really of no importance, either of these two opposed treatments are ‘valid’. s0 = c* su , i.e. the relation s0 : su = c*: 1. But s0 and su are, by hypothesis, universal constants and so is c* . Furthermore, since by definition sv tv = s0 t0 = Ω = constant , t0 /tv = sv/s0 and, fitting in the ‘ultimate’ s value, we have t0 /tu = su/c* su = 1 : c*. In the case of ‘time’, the ‘ultimate’ dimension tu is a maximum since (by hypothesis) t0 is a minimum. c* is a measure of the extent of the elementary Event Capsule and this is why it is so important. Note 1 Zeno of Elea noted the ‘relativity of speed’ about two and a half thousand years before Einstein. In his “Paradox of the Chariot”, the least known of his paradoxes, Zeno asks what is the ‘true’ speed of a chariot engaged in a chariot race. A particular chariot has one speed with respect to its nearest competitor, another compared to the slowest chariot, and a completely different one again relative to the spectators. Zeno concluded that “there was no true speed” ─ I would say, “no single true speed”. Note 2 The observant reader will have noticed that when evaluating sin φ = v/c and thus, by implication, cos φ as well, I have used the ‘unattainable’ limit c while restricting v to the values 0 to c*, thus stopping 1/cos φ from becoming infinite. Unfortunately, this finicky distinction, which makes actual numerical calculations much more complicated, does not entirely eliminate the problem as v goes to c, but this important issue will be left aside for the moment to be discussed in detail in a separate post. I am undecided as to whether any particular physical importance should be given to this value ─ possibly experiment will decide the issue one day. In the event of v taking rational values (which requires a re-appearance rhythm other than 1/1), we get even more outrageous ‘lengths’ for sv and tv . In principle, such an enormous gap between ksanas, viewed from a vantage-point outside the speeding event-chain, should become detectable by delicate instruments and would thus, by implication, allow us to get approximate values for c and c* in terms of the ‘absolute units’ s0 and t0 . This sort of experiment, which I have no doubt will be carried out in this century, would be the equivalent in UET of the famous Millikan ‘oil-drop’ series of experiments that gave us the first good value of e, the basic unit of charge.